Artificial Socket Expanders are Self Expanding Tissue Expanders (SETE) for tissue expansion of an anophthalmic socket. These are mainly dry devices that are stable, made up of a cross-linked, physiologically well tolerated hydrogel. What is Anophthalmos? What is a Contracted Socket? Anophthalmos, (Greek: “without eye“), is the medical term for the absence of one or both eyes. Both the human eye and the ocular tissue are missing from the orbit. The absence of the eye (which can occur genetically or post eye removal surgery) will cause a small bony orbit, a contracted mucosal socket, short eyelids, reduced palpebral fissure and cheek prominence. As the eye socket is contracted, it becomes impossible for the patient to wear an artificial eye (ocular prosthesis), in severely contracted sockets. How do these tissue expanders work? The size of the socket expander is initially small. The body fluid is absorbed from the surrounding tissue by osmosis after the implantation, and the size of the artificial tissue expander slowly grows. The volume of the implant is hence increased 3 to 12 fold, leading to slow expansion of the contracted socket. The expanded tissue acts as a repository (container) for a permanent implant & an artificial eye can then be fitted in the small socket. These tissue expanders are temporarily used implants for a maximum period of 6 months depending on the indication. There are a variety of self expanding tissue expanders available in different shapes and sizes. SETEs are available in about six different shapes and around 25 different sizes. 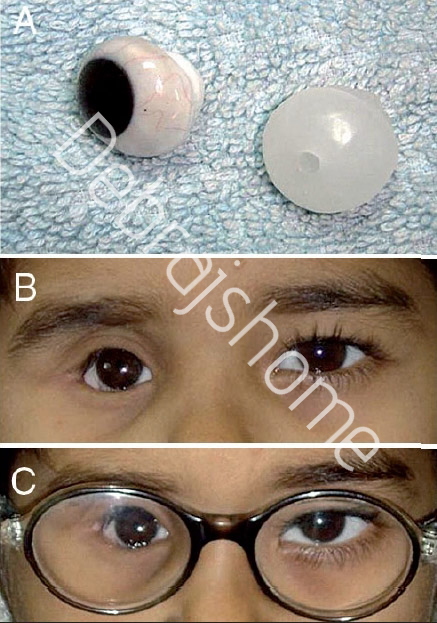 Indications: Treatment of clinical congenital anophthalmos and microphthalmos. The bougienage (the procedure for dilating tubal organs) of the connective tissue sac that is present, enables the placement of a bigger and cosmetically attractive artificial eye (prosthesis). Indications: Treatment of clinical congenital microphthalmos and anophthalmos. Its implantation leads to improvement in an aesthetic aspect. The lid apparatus will be seen as a “curvature” and will not look like “sinking in”. The bougienage of the orbital expander will encourage growth of the middle face and guarantee the symmetry of the face. Self filling devices that comprise of an osmotically active hydrogel. It’s a material that is also used in contact lenses. They expand to sizes already determined. Accurately defined for each expander for surgical planning. Chances of contracting an infection are very less. It requires local anesthesia and a short surgical procedure with small incision. There are zero chances of reusing the device as these are disposable tissue expanders. And hence are hygienically safe. Templates are pre-determined sizes to which the SETE expand. A specific template is provided for each shape and size for enabling the surgeon in aptly defining the recommended size of the pocket for the implant and the final size of the expander after swelling. Implantation of orbital & socket expanders should be carried out about 6 weeks to 3 months before artificial prosthesis fitting. The position of the orbital socket expander should be marked. The skin incision should be placed relatively far from the site of implantation, so as to avoid interference with wound healing due to the tension of the expander as it swells. Template usage is proposed to accurately mark the patient. Implantation can be performed under either local or general anesthesia depending upon the patient’s choice. While removing the expander, general anesthesia is preferred. After disinfecting the skin, the incision is infiltrated with 1%lidocaine containing vasoconstrictor epinephrine (1:200,000). Incision is taken longitudinally to the edge of the tumour or the scar outside from the area that needs to be expanded. The skin and fascia are separated bluntly and partly with the help of cautery until a pocket is created, which is double the size of the expander. subtle hemostasis should be done using cautery. Sharp instruments should not be used for insertion of the osmosis expander. or scar and an adapting corium suture with the same thread. A drainage tube is not required. After incision of the old suture, the expander rises out of its pocket. The removal is supported by subtle pressure to the expander. Big expanders can easily be cut into two or more pieces in order to facilitate removal through a small incision. Then, the pocket is irrigated copiously with 0.9% saline or Ringer’s lactate solution. Marking of the resection area of the tumor or scar is done. After removal of the resection area, a layer-wise wound closure is performed. A drainage tube is not required. Local infection in the area to be expanded. Damaged tissue caused by radiation therapy. Severe psychological instability such as inappropriate attitude or motivation, or a lack of understanding of the risks involved with the surgical procedure and expander. Thin, atrophied tissue in the area to be expanded. Pain as a result of an improperly sized and/or placed implant due to compression of nerves.